Home Biafra News Anambra Terrorist Attack And The Fake Report By Commissioner Of Police In Anambra State. Anambra Terrorist Attack And The Fake Report By Commissioner Of Police In Anambra State. 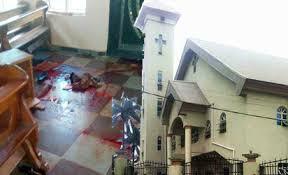 On that eventful day of 6th August 2017, the Catholic faithful at St Philips, Ozubulu gathered to worship their God, but little did they know what awaited them - death and injuries. An eye witness with first-hand information said, "I sat at the back of the church while the worship was going on but the sound of a vehicle caught my attention because we are all villagers and you can easily tell who is who except for strangers or during festive periods when the foreign-based are back. "The sound of the van made me turn back, behold it was painted with an Army colour. But the driver stopped instead of driving in and the occupants of the van all came down. "Due to the light in the premises, I was able to notice that they were bringing out guns while the van stood still in the middle of the gate. When I saw this I had to shout and scale the fence. "But by the time I returned there lay the body of my mother whom all of us came to mass together with", the eyewitness concluded. But from the police report, we were told that it was a communal crash and they came to look for Mr Bishop who returned from South Africa three years ago. And they were speaking fluent Igbo when shooting the people. 1) Who gave those killers Army van and uniform? 2) How far is the said Bishop's house from the church? As a profiler, I examined the motive for action and what triggered it. If it is true they came to look for Bishop and didn't meet him, what was their reason for coming to church and even without asking questions they started shooting everyone, both pregnant women and children? Police said that they spoke fluent Igbo while shooting, but a reasonable reader should ask "how did police know this?" Are there CCTV cameras mounted in the church to ascertain what exactly happened. Even if that's the case, there are many Hausa/Fulanis that speak fluent Igbo language. The eye witness said that he ran away which I honestly believed because the people killed were mostly women who truly could not jump the fence the way the eye witness did. 3) Bishop has brothers and relatives whom the killers could have killed, kidnapped or held hostage but no, they chose to come to the house of God to massacre the poor villagers who gathered to worship God. Why? Was the fabrication of police the reality of w? No, I honestly disagree with the police, because we all know the system of drug pushers - they have no business with you once you don't stand in their way. I sincerely believe that in the history of Igbo people no one has done such - invading the Church on Sunday to kill people - no matter how drunk or annoyed the person is because we respect God. What exactly is the business of the small boy they killed? This massacre is a typical method of Fulani militia. Moreover, what message exactly was Anambra state commissioner of police trying to drive home when he said: "they were speaking fluent Igbo", and how did he ascertain that? Now it is very obvious that those boko haram members who were recently released by the Nigerian government have found their way to Igbo land. What happened on the 6th August 2017 is a clear case of terrorism and should never be swept under the carpet. True to Nnamdi Kanu words - "we are being rounded by boko haram". All the security outfits in Nigeria and in the whole Biafra land are being headed by them. This incident is heart breaking and should open the eyes of those who are still in doubt and hoping to vote again. For the sake of all that died, it is time to send a strong message to the Nigerian government and the world. Come November 2017, no one should step out to vote in Anambra state. It is very clear now that they are out to kill us and all you see in Biafra land government houses are all puppets doing the biddings of their masters Hausa-Fulani. May the souls of all that were massacred continue to rest in peace in the bosom of the Lord. Amen.